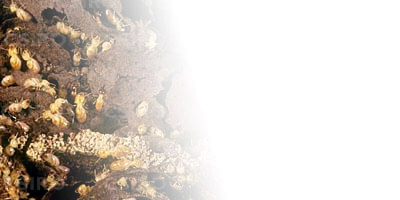 Subterranean termites require moist environments to survive. They typically live underground where moist is present. These pest are known to cause damage to buildings, by biting on electrical cabling as well as wood structures and drywalls, resulting in power failures in homes and industrial places. Termites are hard workers, they work 24hours a day and it is easy for an infestation of aggressive termites to form sub-nests in the interior of structural property. This often happens when the present colony becomes too congested and overpopulated that there is a need to find a new "home". When a pair of male and female alates find a new place through cracks, they will shed their wings and after coitus, a new nest is formed. Inevitably, these two will become the new King and Queen of the colony. The Queen termite is one of the rare species of insects in the animal kingdom that demonstrate extreme physogastry, it has the capacity of laying up to 20,000 eggs a day. As such, its main job is to reproduce. The larger the nest, the larger the Queen. 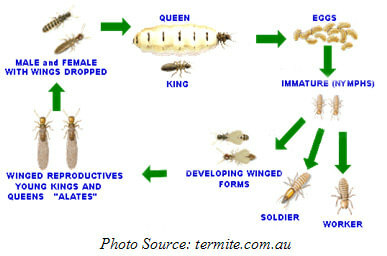 King termites on the other hand do not increase much in size as compared to the Queen. There are different roles for each caste in the colony. The workers are in charge of a process called "trophallaxis" whereby one colony member feeds another, as well as the digestion of cellulose-based food. 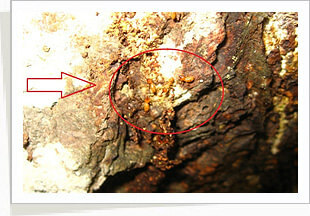 Other tasks that worker termites carry out include, attending to the Queen's every needs including feeding, carrying her eggs to the nurseries. However, the King and young ones also have their welfares well taken of by the worker termites. Soldier ants on the other hand as their name state are put in charge of defense of the colony, warding off predators such as ants using their powerful mandibles as well as fontanelle by emiting a white sticky substance when disturbed. The presence of termites is not easily spotted because they often hide behind wallboards, door frames, or wood trim. There is a need for a professional inspection by a well-trained and experienced pest control personnel in order to access the situation and implement the pest treatment recommended.